Step One: Choose fresh, and tender produce. Freeze soon after harvesting to preserve as many nutrients as possible. Choose organic or locally grown produce that is grown without chemicals. Step Two: Wash the vegetables and cut them into uniform-size pieces where practicable. Step Three: Steam blanch the vegetables by filling the wire mesh basket of a steamer with prepared produce. Set it over 1 to 2 inches of boiling water and cover the pot. Begin timing. Steam for 3-4 minutes: Asparagus, beans, cabbage, peas, bell peppers, summer squash, and zucchini. Steam 5-6 minutes: Broccoli, brussel sprouts, cauliflower, corn, eggplant, and okra. No steam necessary for onions, leeks, and garlic. Step Four: Cool the vegetables quickly by plunging them into a sink or bowl of ice water. You only want to lightly steam them to save as many nutrients as possible. Step Five: Pour the cooled vegetables from the basket onto a clean towel. Gently roll up the towel to remove excess moisture, but don't squeeze. Step Six: Pack in freezer containers at once, seal, label, and freeze. For many things including soups, vegetables, and other dishes that I thaw all at once, I like to use glass jars. I'm moving away from using plastics as much as possible. I still use ziploc bags for fruit that I freeze. I use frozen fruit for smoothies and it's nearly impossible to get a chunk of frozen fruit out of a glass jar. Remember that moisture and air (oxygen) are the main enemies of frozen foods. It's important to use air tight packaging. Moisture loss occurs when ice crystals evaporate from the surface of frozen food, and the result is freezer burn. Fruits lend themselves to freezing much better than vegetables as they retain nutrients and don't degrade the same way vegetables do. They generally don't need blanching and so can be frozen and used in their delicious raw state. They do suffer some softening in the process of being frozen. Freezing converts the water contained in any food from a liquid to a solid. Because the water expands when it freezes, the structure of the cells is altered, breaking down the cell walls. Consequently, all food will be softer once it has thawed. The more water in a food, the greater this change will be, and that's why some frozen fruits with more water don't fare as well. There are two ways to freeze fruit - a dry pack or floated in a sweet syrup. Since I use most of my frozen fruit for smoothies, I prefer to just wash the fruit and freeze it immediately in a plastic bag. If you are thawing your fruit and serving it or using it in a recipe, experts recommend floating your fruit in a syrup and then freezing it. This method will preserve the taste and appearance of your fruit. An easy syrup to make is 1 cup of honey or agave to 4 cups of hot water. Let the syrup cool to room temperature. As you pack your fruit in bags or glass jars, fill to just cover the fruit with the honey/agave syrup. 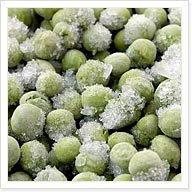 For more information on freezing foods and how to avoid nutrient loss see Tuesday's post by clicking here. I'll be freezing summer squash and zucchini. This post was very helpful. I'm growing watermelons and honeydews. Do you think freezing these will be okay? Is there anything special I need to do? Because watermelon and honeydews have alot of water they will be subject to the change I discussed in the article where they will become soft when thawed. Add honey and some lemon juice when freezing. You can best preserve the texture of the fruit if served before entirely thawed. If you are preserving to use in smoothies - it doesn't really matter. Throw some in frozen and blend up for a nice icey creamy smoothie.